The subject relates to a passage by the Greek writer Xenophon about the youthful Hercules deciding between Virtue and Pleasure. Dürer shows Pleasure lying naked with a satyr, about to be beaten by her opponent. Hercules wields a tree-trunk, ready to enter the fight. 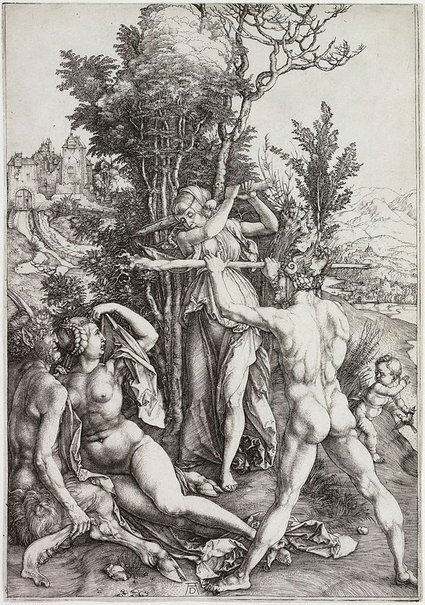 Dürer was inspired by Italian art for his representation of classical nudes in the landscape. The reclining figure is derived from an engraving by Mantegna while the muscular figure of Hercules is borrowed from a print by Antonio del Pollaiuolo that Dürer probably saw during his first trip to Italy in 1494–95. Signed l.centre, [incised plate] "AD [artist's monogram]". Not dated. Art Gallery of New South Wales picturebook , Sydney, 1972, 7 (illus.). This engraving appears with the title of `Combat of Virtue and Pleasure in the presence of Hercules'. Piety and Paganism , Sydney, 1991, 4, 13.